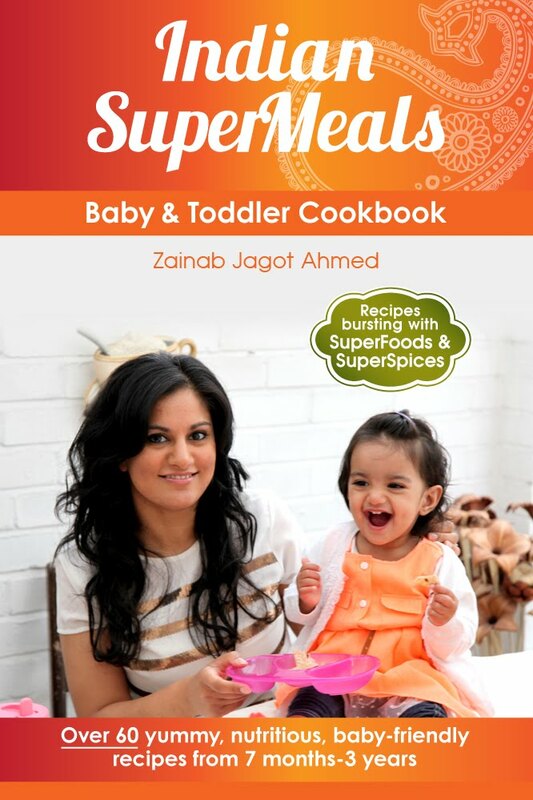 Those of you who know me well won't be surprised that I literally leapt for joy when Zainab Jagot Ahmed contacted me to ask me to review her electronic cookery book - Indian SuperMeals: Baby & Toddler Cookbook. It claims to be the first ever Indian baby cook book (long overdue, methinks) and to me it is totally perfect, nothing too outlandish in terms of Indian cookery but just lots of healthy and exciting recipes for stage 1 weaning upwards right through to family meals. One of Holly's very first ever foods was a lentil and sweet potato curry and one of Lara's was a simple tarka dal. I'm not somebody who needed convincing that introducing exciting flavours and spices to a baby from a very young age can encourage a more adventurous palette but I was surprised to read so much in Zainab's book about the health benefits of different spices and it has really encouraged me to add different spices and ingredients to all of Holly's food, not just the recipes that I have followed from this cookbook. Indian SuperMeals: Baby & Toddler Cookbook is available exclusively electronically - you can get it for various different e-reader devices including Kindle. I downloaded a copy for Kindle on my PC. I am a bit of a traditionalist when it comes to recipe books. A cookbook is made for sitting on the work surface next to you and getting covered in turmeric stains. I think this book would capture more hearts if you could buy it in hard copy to sit in your bookcase alongside your Annabel Karmel equivalent! I enjoyed reading the introduction to Zainab's book - it reminded me a lot of Annabel Karmel's Baby and Toddler cookbook in terms of its thorough, no-nonsense approach to weaning but there was also a lot of useful information that explains what supermeals are (super foods and super spices) and what the benefits of different ingredients and spices are for your baby. But really it was the recipes that I was interested in. 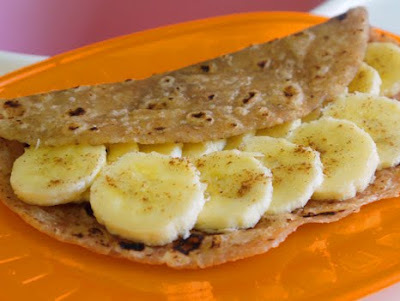 There are a few stage 1 weaning recipes and lots of stage 2 and 3 recipes of mashed and pureed food as well as finger foods. When it gets to stage 4, there are a good selection of family-friendly Indian recipes that you can all eat together without having to worry about salt and sugar content. 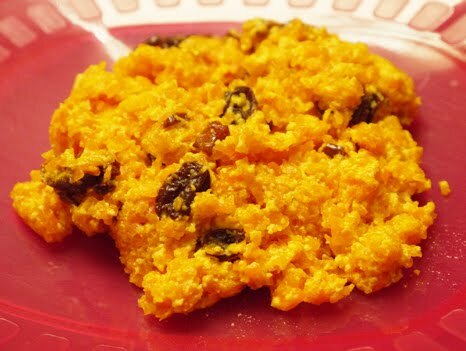 I loved the balance of savoury and sweet foods - Indian sweets are not something I have experimented with before and I was really pleased to make my first traditional grated carrot halwa for Holly (and the rest of us). Almost all of the baby foods appealed to us and it was just a case of where to start first! My very first recipe from the book was an Aubergine Bharta because it was something I never would have considered making before and looked like it would be a good lumpy texture for Holly. I think that this Indian weaning recipes book makes a perfect addition to my ideas for nutritious, healthy and exciting baby foods for my little girl. My only real niggle with it though is that some of the photos need to have a little more pizazz injected - they all look like baby food in a baby bowl which I know is what they are, but they don't sell the food to me; in most cases the photos aren't mouth watering enough to make me want to get up now and start cooking. Indian SuperMeals: Baby & Toddler Cookbook is the perfect cookbook for people looking to find inspiring ideas for baby foods or for people who love Indian food themselves but are a bit wary of feeding them to their baby. It would make a great gift for new parents and you can buy it on Amazon, Waterstones or Kobo books as a gift.